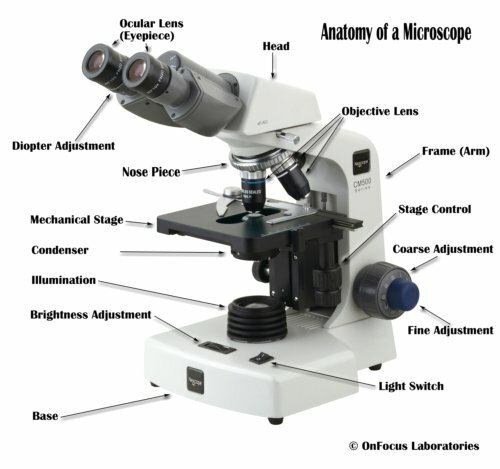 Home › Category: Biology › what are the parts of microscope & their functions? 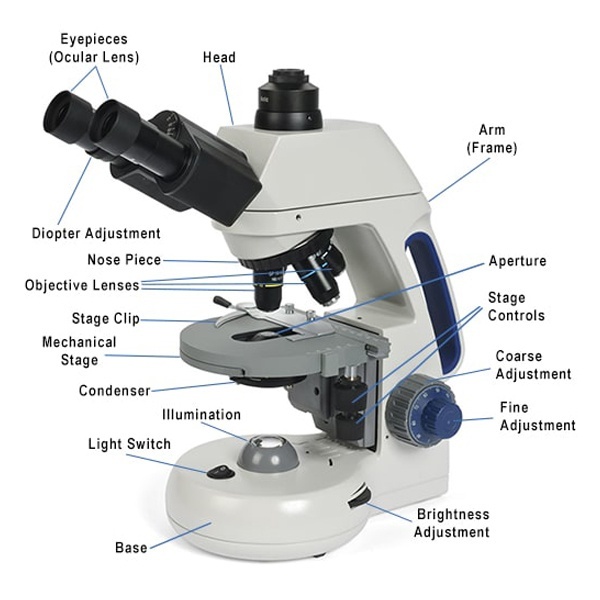 Before you buy or use a microscope, it is important to know the parts and the functions of each one. The parts of a typical modern complex compound microscope are described below. Eyepiece (EP): The eyepiece lens is attached to the top of the tube you are looking at in the fig above. The eyepieces standard lens powers are 5X or 10X of 15X or 16X. Revolving nosepiece (RN): This moveable part house two or more objectives lenses. Nosepiece (NP): You often find three or four objective lenses on a nosepiece with 4X, 5X, 10X, 40X, 100X powers. The low powers (4X, 5X, 10X, 40X) are called “dry” scan objectives. Power 100X forms the oil immersion. You should note that the shortest lens has the lowest power; the longest one has the highest power. Condenser Lens (CL): You may use CL to focus light onto the specimen on your microscope stage. You need to use it most at a higher powers (40X and 100X) to give you a sharper image than those microscopes without CL. Your CL adjusting knob is located on the other side of your microscope to move the CL up and down to focus a good quality images. The CL rated at 0.65 – 1.25 will give you maximum benefit if you operate your microscope at 40X and 100X objective powers. You should set very close to the slide at 100X and further down away at the lower powers. Stage (ST): The flat plate where you place your slide for viewing. the CL. You may use the DN to vary the amount and size of cone light reaching the slide from below. No rule of thumb as to setting you should use for a particular power. The setting is a function of transparency of specimen, contrast, and objective lens in use. Base (BA): The bottom of the microscope use for support and house the power source, fuse and illuminator. Power Switch (PS): This switch controls light supply to the microscope. Condenser Mover (CM): A knob you use to move the condenser up or down, to attain a good quality of light. Focus Knobs (FN): Knobs that make rough and fine adjustments to be focused. You have two knobs on a microscope, large knob is for coarse focus, and the small one is for fine focus. The latter is used at a higher power objective. FN moves the stage up and down when you turn the knobs. Rack Stop (RS): You may use this knob to lock the stage level after adjusting how close the objective lens can get to the slide. You do this to avoid making the high power objective lens down into the slide and break it! It is often set at the factory. Stage Holder (SH): Seat on which the stage is resting, connect it with me FK knob, which in turn move the stage up or down when you turn the FK knob. Stage Clip (SC): The stage clip holds the slide in place. Arm (AR): It attaches the eyepieces and the objectives to the base. Stage and Slide Mover: Stage mover knob (big upper knob) is used to move the stage forward or backward to position the best quality specimen. While, the small lower knob moves the slide to either left or right to position the best specimen for view (Look at the other side of your microscope for the combined knobs).